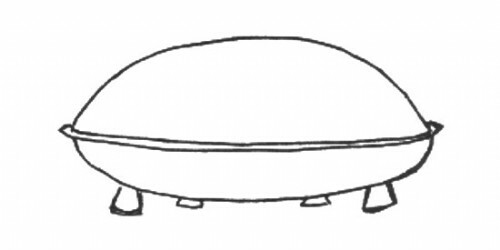 Drawing of the “device” by the witness. 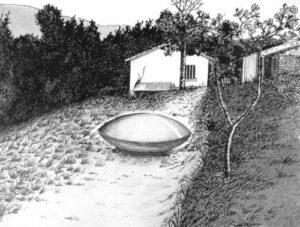 The Trans-en-Provence UFO event occurred on January 8, 1981 and was observed by a single witness. 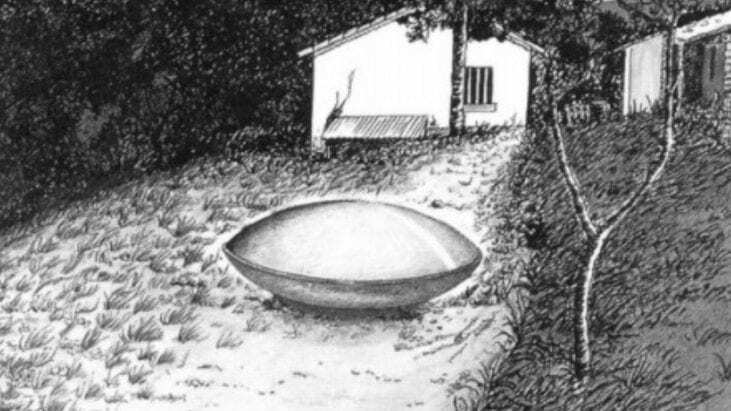 Due to the French privacy laws, the case was originally published with the witness name replaced with the pseudonym Renato Collini; however the witness name is by now well known to the UFO community as Nicolai. I have lived in Trans-en-Province at my current address for nearly 14 years. My wife and I live alone. She is the cleaning lady at the social security office in Draguignan. I have not worked since November 1979. I was previously an employee of the SCNI company. This firm went out of business and I was laid off. I recieve a disability pension because I suffered from a heart problem since 1973. Yesterday, January 8. 1981, I was busy around the house as I am practically every day. I was behind the house, which is built over a restanque (raised level). I was building a concrete shelter for a water pump. Behind my house on the same level is an expanse of flat ground. It is reached through a path along the base of the house. It was about 5PM. The weather was turning colder. My attention was attracted by a slight noise, a sort of faint whistling. I turned around and saw a device in the air at the height of a big pine tree at the edge of the property. This device, which was not spinning, was coming lower toward the ground. I was only hearing a slight whistling sound. I was not seeing any flames, either below or around this device. While it was continuing to come down, I went closer by walking towards the stone cabin above my house.When I placed myself against the wall of the cabin, I could see very well over the roof, since this cabin too is built over a raised level. I was on the higher level, about 1.2 m from the roof. From that position, I clearly saw the device resting on the ground. Right away it lifted off, still emitting a slight whistling sound. Reaching a point above the trees, it left at high speed toward the forest of Trans, that is, towards the northeast. 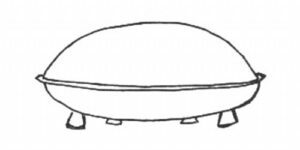 The device had the shape of two saucers, one inverted on top of the other. It must have measured about 1.5 m in height. It was the color of lead. This device had a ridge all the way around its circumference. Under the machine I saw two kinds of pieces as it was lifting off. They could be reactors or feet. There were also two other circles which looked like trapdoors. The two reactors, or feet, extended about 20 cm below the body of the machine. I have not felt any disturbance of the sense of vision or hearing. There [the witness] discovers a sort of ovoid vehicle, with the general shape of two half spheres of unequal volume, clearly separated by a flat ledge, extending at least 15 cm and forming a ring around the metallic mass which has a… height of between 2 and 2.5 m/… The machine lifts off, making a slight amount of dust and with a soft whistling. Then it seems to tilt, exposing its underside, and it takes off at lightning speed, passing exactly between the two tall trees, at the exact spot from which it had seemed to fall. The witness has noted that the landing trajectory is not identical to the takeoff trajectory. GEPAN (a department of the French Space Agency responsible for the investigation of UFO reports) also reconstructed the trajectory and duration. The Takeoff Phase … the object was resting on the ground for several seconds before it suddenly rose vertically over several meters, tilted… continued to rise in this position and disappeared in the sky. Note that this object is engaging in the behavior I have termed “drop-in”, where the object arrives on a steep trajectory and departs on a steep trajectory, with only a short period in the landing or near landing location. 3 secs Object strikes the ground with a sound like a stone falling. The motion from the trees to the impact point is fast and continuous. Assuming the distance from the impact point to be 35m for the top of the tree, and assuming the altitude to be above the tree (stated to be “dozens of meters high”,); because of the error in translation, resolved to 10 m, we take 10 m as the altitude of the object; the distance traversed between first sight and impact is therefore 14 m.
4-25 secs Object is on the ground and the witness is continuing to move to a new location. Assuming 8 secs to walk 10m (a reasonably brisk walk), walking 30 m takes 24 secs, of which it is assumed 1-2 secs are used while object is descending, since the report refers to “while it was continuing to come down, I went closer by walking”. 28-35 secs Object lifts from the ground, tilts, and departs. Altitude appears to be that of the tops of the trees, here estimated to be 10 m (“it lifted off… reaching a point above the trees, it left at high speed”). The GEPAN account differs somewhat, claiming “it rose vertically over several meters, tilted above the platform, continued to rise in this position and disappeared in the sky.” Hopefully “several” is 10 or so. An analysis of the formation of the trace is available below. While several analyses of the Trans-en-Provence UFO landing trace have been performed, no analysis is known to this author which attempts to constrain when in the sequence of events the trace was formed, or the implications of that formation time for the possible energy output levels and falloff rate of the force which created the trace. This paper describes a rationale for considering that the trace was formed on departure, and that the energy output which formed the trace has a relatively rapid falloff with distance. The trace was found by the witness immediately after the departure of the object. The trace was circular, 2.4 m in diameter, and had the form of a ring, 0.2 m in width (it is claimed that there is a “crown” to the trace which is only 0.1 m in width,). Note that the witness reported the object surrounded by a shelf approximately 0.15 m in width. 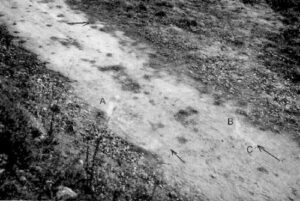 Photographs show the trace as lighter in color than the surrounding dirt. Vegetation remains (leaves and sticks) from the edges of the path where the object landed are seen to cross the trace (as of the next day). There does not appear to be any preferential orientation for this material, nor does it appear affected by pressure or heating. In combination, this indicates the possibility that either a) the force which produced the trace had no outward and no inward components, or b) the material was swept back over the trace either at or after the object departure. Note that the witness mentioned the object’s departure as having raised some dust. The width of the ring as photographed and diagrammed shows no notable deviation, nor does the circularity of the ring show any notable deviation. The trace was formed at the time the object decelerated. The trace was formed when the object impacted the ground. The trace was formed when the object was resting on the ground. The trace was formed when the object rose from the ground. The trace was formed when the object hovered before accelerating away. For the purpose of these hypothesis it is presumed that the trace is a side effect of a force exerted by the object. Geometric discriminators relate to expectations of the geometry of the trace based on the dynamic behavior of the object. Energetic discriminators relate to whether a given hypothesis can, from the present or required kinetic energy, generate the temperature change expected based on the trace analysis. The trace is circular, in the form of a ring. No notable deviation from circularity appears to be present. No other traces are visible. Most prominent trace effects are E, W, and slightly less to the N on the ring. The trace shows the effects of heating to below 600 degrees C. This heating was thought to be due to friction or impact,. The trace is a ring either 0.2 or 0.1 m in width. The outer diameter is 2.4 m. If the inner diameter is 2.2 m, the area of the ring is 41.4 sq m. If the inner diameter is 2.3 m, the area of the ring is 21.15 sq m.
The trace shows effects to a depth of 1 cm in the thickest area of the trace. The volume of the trace is thus 0.04 cu m.
The object mass is 700 kg. The acceleration due to gravity is 9.8 m / sec / sec, and the speed after falling 10 m is 14 m / sec or 50 kph. The kinetic energy of the 700 kg mass at the end of that fall is 6.86 x 10^11 ergs (6.86 x 10^6 joules). The object engaged in forward motion during descent. It was first observed 35 m from the impact point. The forward speed is 34 kph, assuming a constant deceleration over 3 secs to a speed of 0. The forward kinetic energy is thus, at first appearance, 3.07 x 10^11 ergs (3.07 x 10^6 joules). The total energy of the object (kinetic and potential) at its first appearance, is 9.93 x 10^11 ergs (9.93 x 10^6 joules). This is, in essence, the energy budget of the object, which it is assumed must be dissipated prior to or at the time of intersection with the ground. A force was emitted as a cylinder with a wall 0.1-0.2 m thick and that cylinder extended perpendicular from the rim of the object, and this force was the means by which the trace was formed. This is supported by the correspondence between the width of the rim and the width of the circle. The ground has a specific heat 1/5 that of water (838 joules / kg – degree C). Forward motion would smear the trace away from circularity, which is not observed. Forward motion with the force cylinder pointed toward the trace would cause the force cylinder to have an oval intersection with the ground, which would approach circularity as the object approached the trace site. This is not observed. There is no preferential effect on any part of the trace which is along the line of travel (incoming WNW, outgoing ENE). Preferential effects do not show a correlation with the line of travel. If the object retained any forward motion, the objections raised to the previous hypothesis still hold. If the object had dissipated all forward motion, the only remaining motion would be downward. If all of the vertical potential energy, now kinetic, were dissipated into the trace, a temperature increase of only 1.36 degrees C would be the result. This is insufficient to cause the observed effect. Addition of the forward motion only increases the temperature by 0.61 degrees C.
The imprint of an impact would show an the “feet” rather than the shape of the rim, unless the feet were not extended until departure. If the feet were not present, the imprint would take the form of the bottom of the object. In either case, the expected imprint is not observed. The imprint of the object resting on the ground would show an imprint of the feet rather than the shape of the rim, unless the feet were not extended until departure. The expected imprint is not observed. A weight of 700 kg undergoing gravitational acceleration cannot produce the levels of heat observed. This is supported by the shape of the trace, which indicates that the force was applied in a nearly circular pattern; if released from the rim of the object, which is suggested by the dimensions of the trace, there are no apparent variations in geometry which might be attributed to wobble or to a sweep of the force cylinder to one side or the other. The full force of the thrust was expressed as pressure on the ground within the area of the ring. If this is the only contributor to trace formation, this pressure must be sufficient to heat the ground to some affective temperature below 600 degrees C.
Electromagnetic radiation was dissipated as heat within the area of the trace. This radiation might be a side effect of the thrust. Subhypothesis 1 is not supported, since the maximum suggested thrust (91,840 kg in the 0.5 sec to 5 m scenario) creates a pressure of only 2 atm, or 23,000 kg / sq m. This is not sufficient to produce the indicated heating. Assuming the kinetic energy of the particles of subhypothesis 2 to be the same as the kinetic energy of the object at the end of the acceleration phase, the highest degree of heating produced would be near 3 degrees C. Thus, subhypothesis 2 is not supported. Insufficient information is available to assess subhypothesis 3. Since we do not know much about the spectrum of possible radiation, it is difficult to make any estimates as to how much energy might be needed to created the observed heating. All of these hypotheses and figures should be examined, keeping in mind that the weight estimate is based on the weight effects on the trace, and if the weight of the object did not cause the trace, the trace forces may simply reflect the weight of the object combined with the force of the thrust. Under these circumstances, thrust, energy and weight estimates used above would be much less meaningful, except insofar as they provide upper limits to the actual values. Given that the thrusts and energies of hypothesis 4 (except for subhypothesis 3) are insufficient to produce the trace, the forces in a hover at a higher altitude would also be insufficient. Further evidence that this is the case comes from a geometric analysis, which shows that the subsequent tilt of the object would have produced an elongation of the trace, or a variety of parabolic or hyperbolic secondary traces, none of which were observed. Geometric evidence indicates that the trace was not formed on approach, impact or during the tilt to final departure phase. Kinetic energy to heat conversion evidence indicates that the trace was not formed on impact or by the object resting on the ground, or by the thrust of the object on departure expressed either as pressure or as the kinetic energy of particles ejected from the rim of the object. These findings support the idea that the Trans-en-Provence trace represents an unconventional event. These findings also place certain limiting conditions on the forces used by the Trans-en-Provence object. For instance, it seems that the object did not generate trace-producing force on the ground during the approach phase, despite the need to dissipate apparently considerable kinetic energy in the downward and forward direction. Furthermore, it apparently did not generate trace-producing force on the ground during the tilt to depart phase. In both of these phases, the altitude appears to have been approximately 10 m.
This indicates an extremely localized force. A similarly sized helicopter, for instance, hovering at 10 m would create a large disturbance on the ground due to the downward flow of air from the rotors. Weight measurements are critical. Even an upper or lower bound weight can be helpful in dynamic simulations. But no information about the weight of the object can be inferred without measurements of the resistance of the soil to penetration. Depth of the trace or pressure resistance of the trace is meaningless without control measurements outside and at some distance from the trace. Dimensional measurements need to be precise. The area around a trace must be checked for subsidiary traces. These geometric characteristics need to be able to be checked for the slightest irregularity or deformation. If possible, core samples should be obtained across the trace and in control areas outside the trace. Sample depths of up to 1 foot are preferred. These allow analysts to infer more about the nature of the cause of the trace, and also preserve information which can otherwise quickly decay. If evidence of heating can be found, it can assist in dynamic modeling. 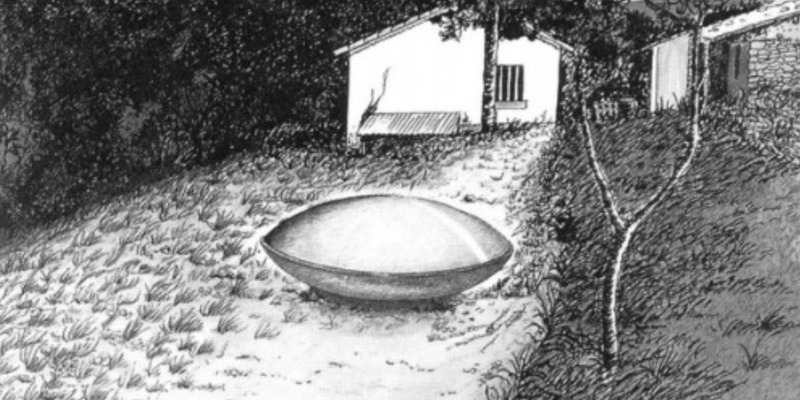 The Trans-en-Provence UFO was able to dissipate considerable kinetic energy without affecting the ground beneath it. This may have resulted in the observed “whistling” sound, which indicates a motion of air away from the object. The object was then able to create close to 600 degrees C of ground heating on departure, despite the apparent insufficiency of mere thrust pressure to produce those temperatures. It then departed after tilting, and did not produce any further effects on the environment at that time. One analysis of the effects of the Trans-en-Provence UFO, based on samples taken at a variety of radial distances from the trace seems to indicate an effect on plant metabolism which varies with the reciprocal of the square of the distance. A similar trace was observed at Delphos, KS, in 1971. That trace, however, was not as focused as the Trans-en-Provence trace, and was wider. Also, the object was seen to hover for some period on a “skirt” of luminosity which was directed toward the location of the trace – this was not observed in the Trans-en-Provence case. There is, however, some indication that some UFOs emit a field which is not visible to the human eye, well as twilight reports which may indicate that UFO luminosity is present at all times, but is insufficiently bright to be seen in the daytime. The event of a UFO impacting the ground and making a noise occured at Marignane (1952), where the object landed on a metal runway grating. My thanks to Gildas Bourdais of France who supplied English documents covering the Trans-en-Provence event, and to J.J. Velasco (CNES) who provided those documents to M. Bourdais. Also, thanks to Jean van Gemert, who helped point out errors in the momentum and kinetic energy computations and who also offered other helpful suggestions. 1. The witness may mean the sort of “bell” that extends from a rocket engine. 4. Perhaps this should be “cannot say”. 5. Unfortunately the size of the comparison stone nor the height from which it might have been dropped were not provided. If they had been, it might be possible to make some comparisons. 6. The analysis below implies the object was on the ground for nearly 30 seconds. 13. It is not stated whether this “crown” is centered in the rings, or eccentric within the ring. 17. No rationale for distinguishing this was provided in the reference.